Palram Greenhouse - Who Has The Best? 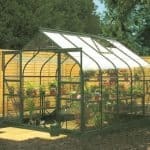 A Palram greenhouse can be an ideal and cost effective solution for an amateur or professional gardener. They are one of the most respected names in greenhouses today, and sell greenhouses in all sizes, and in many different styles. With so many models to choose from, the most difficult part can be finding the one that’s ideally suited to your growing needs. That’s why Whatshed have created this handy guide that will help you find the Palram greenhouse that’s just right for you. For the purposes of this league table we’ve only considered Palram greenhouses, rather than the sunrooms that they also make. We’ve then looked at the price of each model, and the value for money that they offer. We’ve also taken into account the quality of materials used, and their aesthetic appeal. When we review Palram greenhouses we are invariably impressed by their toughness and durability, and their value for money price tag, so selecting the fifteen best models was a far from simple task. 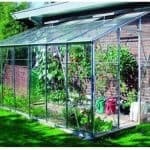 It is outstanding value for money that makes the six foot by four foot silver Mythos greenhouse our choice as the number one Palram greenhouse that can be bought online in the UK today, with an asking price of less than two hundred pounds for what is an excellent, if compact, growing environment. Whether you’re looking for greenhouses, garages, or garden sheds, WhatShed bring you the reviews that can help you make a wise purchasing decision, saving you time and money. There are many attributes that we look for in a greenhouse, and value for money is high up on the list. That’s why this particular Palram greenhouse scores so highly. 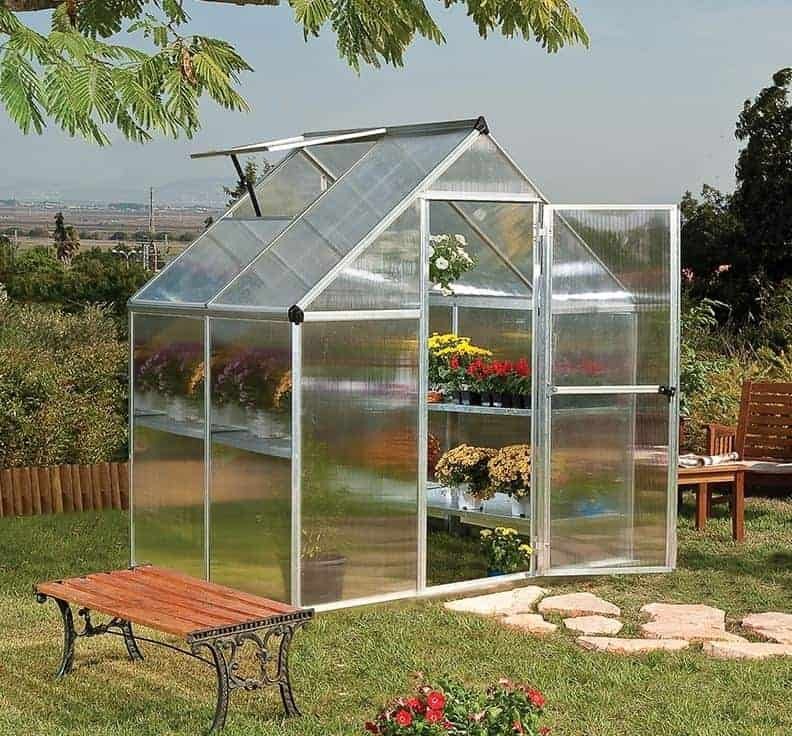 It may not be one of the largest we’ve seen, with a base area of six foot by four foot and a peak height of 2.08m, but it’s price of under two hundred pounds for a well built and durable greenhouse is hard to beat. It means that more people than ever before can afford a compact environment in which to grow plants and seedlings, and it’s this that gains it the very top position in our league table. Unlike some of the more expensive models we’ve reviewed, this features polycarbonate glazing rather than a form of glass. We were still impressed by the 70% light transmission that it allows through however, and one big advantage that it brings is that it’s very shatter resistant as well as being cost effective. 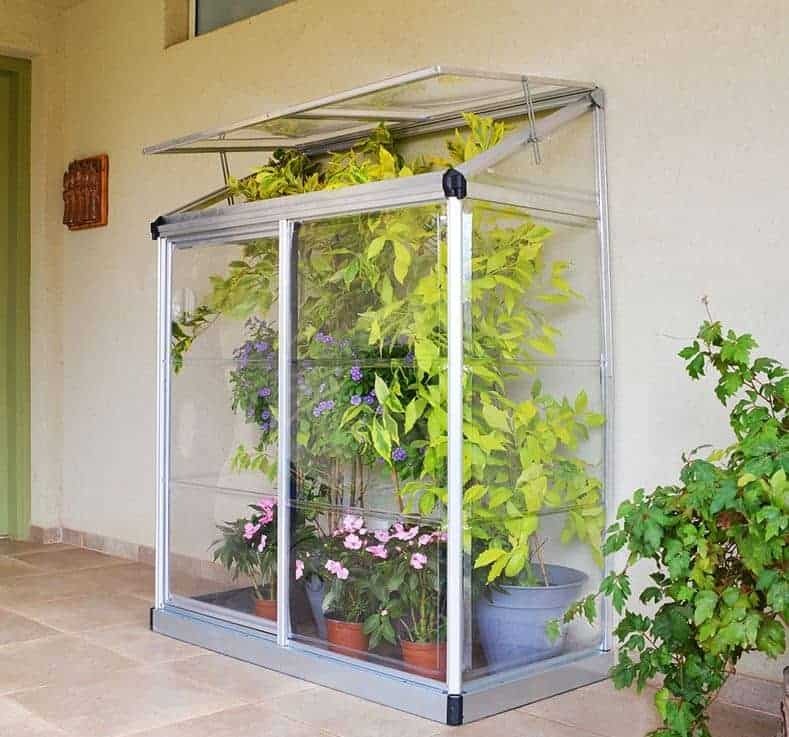 That makes this Palram greenhouse with a silver coloured frame an ideal choice for people who are likely to have small children in and around their greenhouse, as well as people who want an all weather growing environment but only have a small area in their garden or patio in which to situate it. Palram make greenhouses in a wide range of sizes, thereby catering to all budgets and gardens, but this is very much a mid sized model. 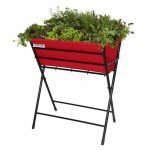 That makes it perfectly suited to most small to medium gardens, allowing them to grow their plants and vegetables all year round. It’s a very eye catching Palram greenhouse, and at first sight we were drawn to the dark green aluminium frame. With clear polycarbonate glazing inside it, it blends in very well with a garden background and looks much more expensive than it actually is. With a price of less than four hundred pounds for a base area of approximately sixty square feet, we were pleasantly surprised by just how much is included as standard. For starters, a strong and sturdy base is included to make it easy to position on your property. This isn’t something that we always see with greenhouses from other manufacturers. The same is true of the five year warranty, although it is very much a standard provision with a Palram greenhouse. We also liked the inclusion of drainage and gutter heads and the easy to open ventilation panel in the roof, and it is these value adding features that help this attractive greenhouse take second place in our top fifteen league table. 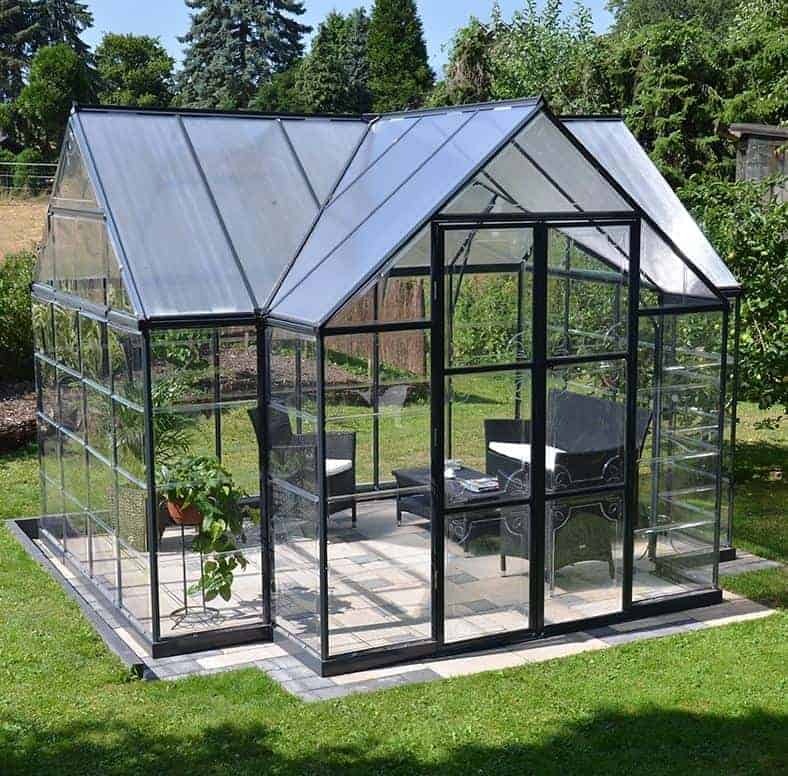 This Palram greenhouse has a unique look different to any other in this league table, and coupled with the sheer versatility that it’s large and accommodating dimensions bring this is enough to gain it a deserved third place. It has a base area of approximately 12 foot by 10 foot, but this doesn’t tell the whole story as it doesn’t have a uniformly rectangular design like most of the greenhouses we review. Instead it has a protruding front section that acts as an entrance porch, and with a dark grey frame it’s also one of the most attractive greenhouses we’ve reviewed. Because of its size and its looks we can imagine this being used not only as a place to grow fruit and other plants, but as a place to relax and look out at the garden. There’s certainly enough room to move around in, and the built in ventilation ensures that it never gets too hot for you or your plants. Shatter resistant polycarbonate is used again, and we also liked the inclusion of an integrated ramp, meaning that it’s easy to transport items in and out on a wheelbarrow. 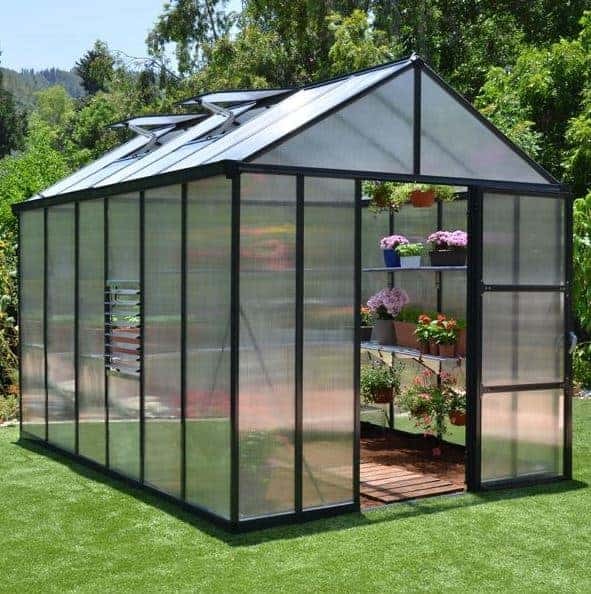 Its price may be beyond the budget of some, but if you are looking for a large and luxurious Palram greenhouse that will enhance the appearance of your garden, this should prove hard to beat. This is one of the largest greenhouses in our league table, with base dimensions of 3.66 x 2.43m, and it’s also taller than we often see in the greenhouses review, with a ridge height of 2.31m. This wasn’t the only thing that made this Palram greenhouse stand out from many of its competitors, as this Balance model also has a double doored entrance. This provides two distinct advantages; firstly it makes it very easy to manoeuvre large or bulky items in or out, particularly if a trolley or wheelbarrow is being used; secondly, it allows for a lot of airflow to reach the interior when the doors are opened, and with two ventilation windows included in the roof as well this is one of the airiest greenhouses that we’ve seen. Once again crystal clear polycarbonate is used for the glazing, which not only has excellent light transmitting qualities for the plants, it also makes it a very welcoming environment to spend time in. That’s why we can easily imagine this Palram greenhouse being converted into a sun room or summerhouse with the addition of some garden feature, and of course those wide opening doors make it easy to move the furniture inside. At just over five hundred pounds it also represents excellent value for money. 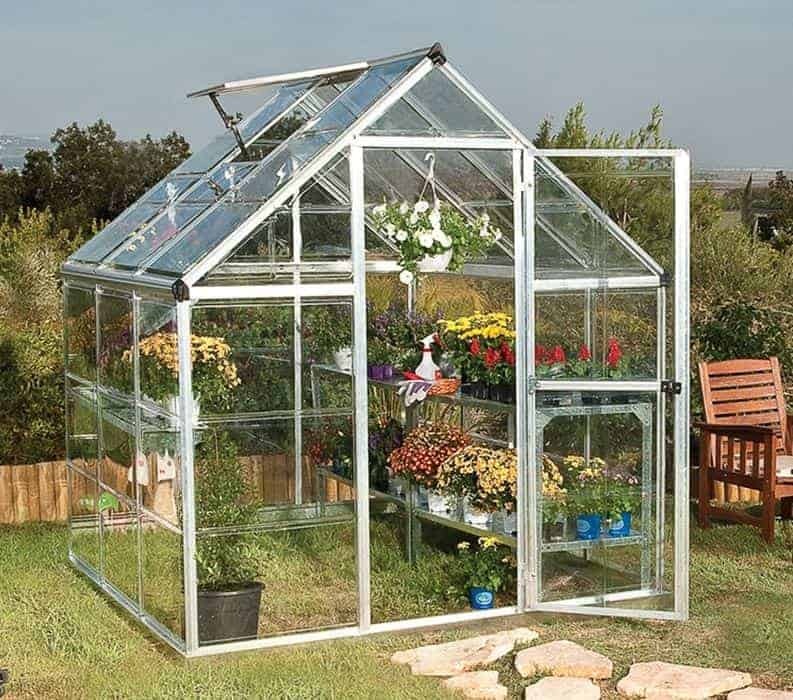 A six foot by six foot greenhouse such as this can be a perfect size for keen amateur gardeners, as there’s lots of room inside for growing plants and seedlings in, and yet it won’t take up too much room from the garden itself. It also means that the consumer won’t be paying for floor space that he doesn’t actually need, and the great value price for this Palram greenhouse of just a little over two hundred and fifty pounds is one of the reasons that it gains a place within the upper third of our league table. 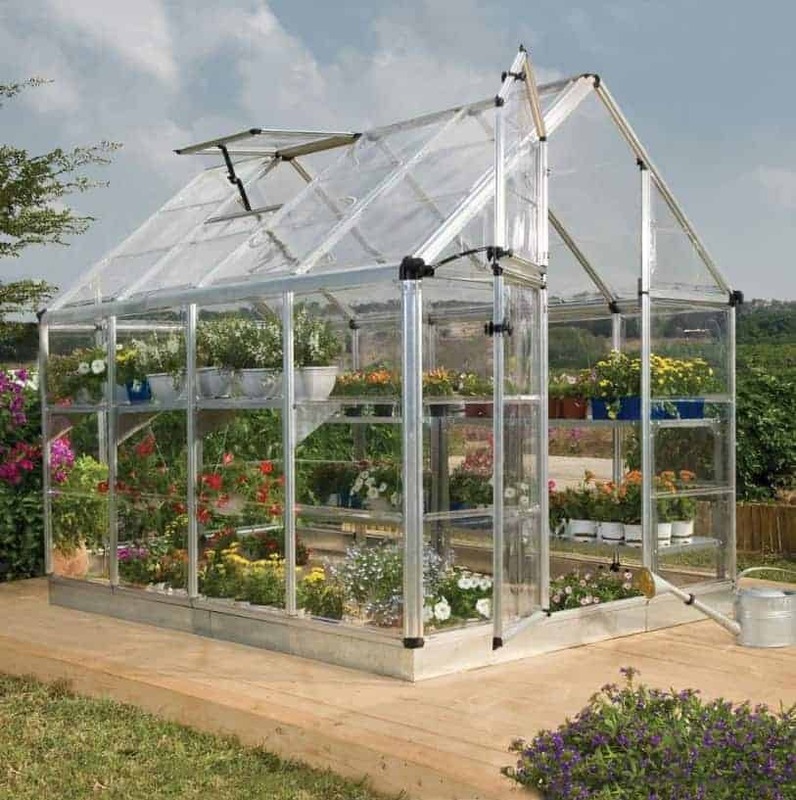 It has a silver frame with clear polycarbonate glazing, and we feel that gives this Palram greenhouse a very clean and contemporary look that we can imagine proving popular with those who have lots of white PVC features in and around their garden. A base is included as standard, and both this galvanised steel base and the aluminium frame are not only tough but also resistant to rust. That’s why we can see this greenhouse retaining its good looks for many years to come, and it could far outlast the five year manufacturer’s warranty that has been supplied with it. With a single door giving easy access, and a ventilation panel in the roof, this is a very practical low cost growing solution. Not all gardens are the same size and shape, but with such a wide range of Palram greenhouses available there’s a model that’s suited to every garden. This is one of the larger models that we’ve reviewed and yet it’s far longer than it is wide, making it ideal for gardens that are either shallow or narrow. Once again its part of the Harmony range, which is one that we especially like as it places the emphasis on practicality and value for money. Those qualities were certainly evident here, and while it may not be the most beautiful or exciting Palram greenhouse that we’ve reviewed it does provide outstanding value for money with an asking price of less than five hundred pounds. With a width of 1.85m and a depth of 4.33m there’s a lot of room for plants to be positioned, particularly if staging is added. There are also two built in ventilation panels that should ensure a steady flow of cooling air reaches all corners of this Palram greenhouse on a hot day. We were pleased to find that high quality polycarbonate glazing had been used as well, which has a very good rate of light transmission at 90%. It also keeps 100% of UV rays out, which can otherwise be damaging not only to plants but to expensive equipment kept inside the greenhouse. This six foot by ten foot model captures the classic look of a glasshouse that so many people admire, and even close up it would be probably be very difficult for viewers to tell that plastic glazing had been used rather than glass. That’s because crystal clear polycarbonate has been used; it provides the same clarity of vision as glass and yet it’s less expensive and also more shatter resistant. That can lead to considerable savings over time, as it means that the owner won’t have to keep paying for new glass panels to replace ones that have been cracked or broken. With 90% light transmission, this Palram greenhouse is still an excellent environment in which to grow even demanding plants. We’ve reviewed lots of Palram greenhouses, and their toughness always impresses us when compared to models from many other manufacturers. One reason for this is the combination of a galvanised steel base with an aluminium frame, silver in colour on this occasion. 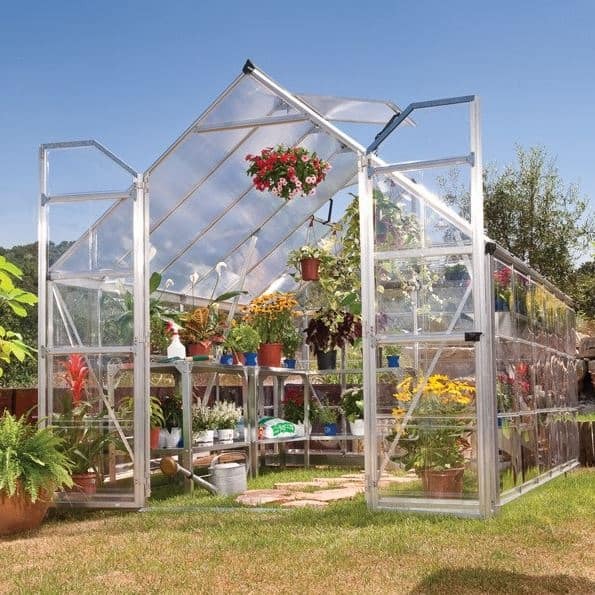 Both of these are rust resistant metals, and they are also very strong and reliable which is why they create a greenhouse that’s likely to feel very stable and rigid once assembled. This is good news especially for those whose garden is in an open area that’s often exposed to strong winds. This Palram greenhouse certainly lives up to its name, with a pleasing on the eye dark green frame that fits harmoniously into a typical garden background. 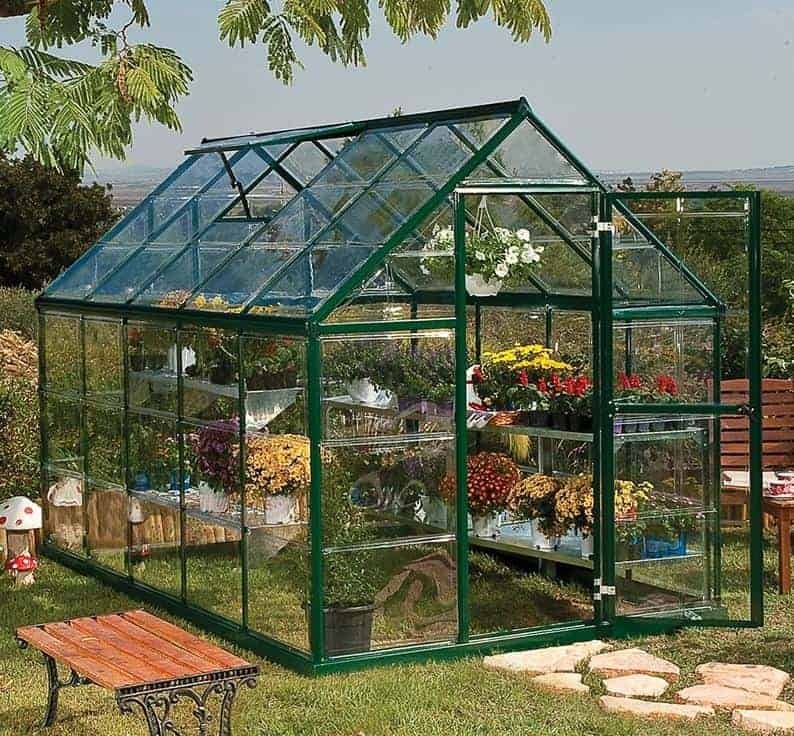 We know that many people prefer green frames on a metal greenhouse for precisely that reason, but it can also bring with it more of a premium cost, which is why this model finds itself placed lower down our league table than the silver model of the same size which takes our top spot. It wasn’t just the colour scheme of this Palram greenhouse that caught our attention, however, as its compact footprint of six foot by four foot gives it a very neat appearance. 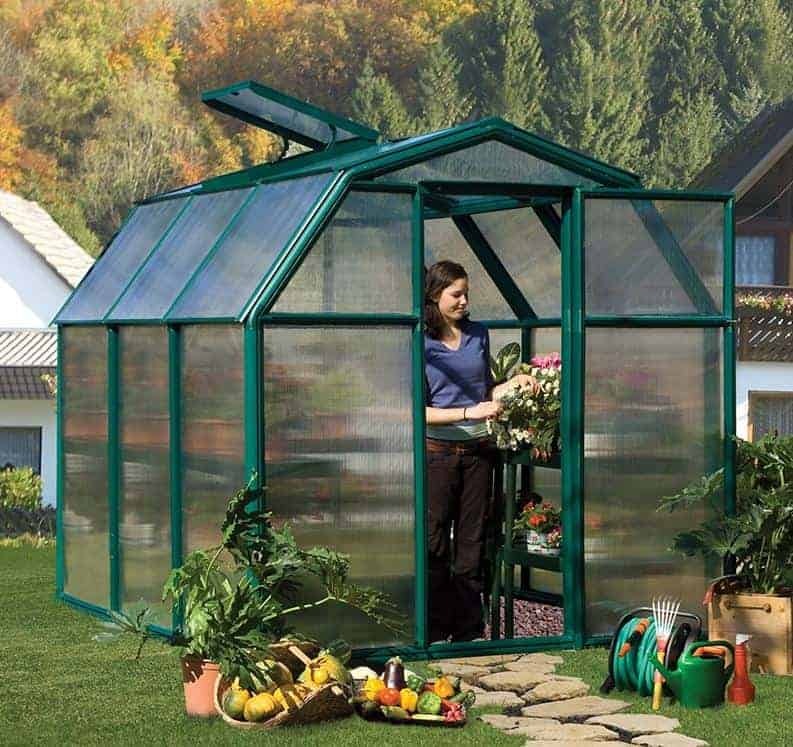 Taking into consideration its size and asking price, it does after all still represent the good value for many that we associate with Palram garden buildings, we feel this would make an ideal greenhouse for beginners or for people who have just moved into a new home. Ventilation and climate control is very easy thanks to the ventilation panel positioned in the roof, and it’s also very tough and weather resistant. 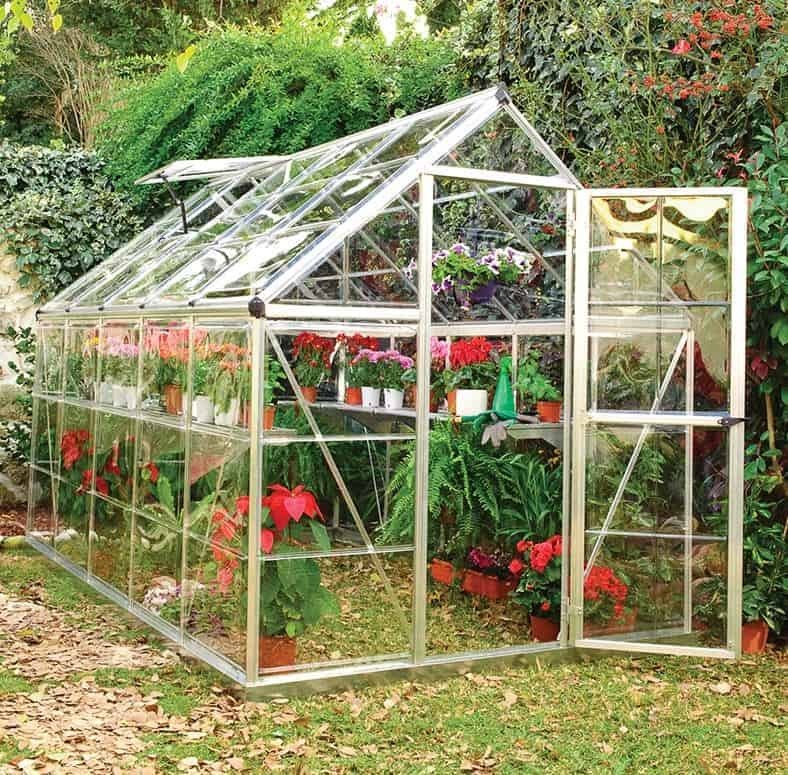 As the frame is aluminium as well, there’s no need to worry about either rust or rot taking hold in later years as there could be with wooden greenhouses for example. 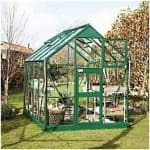 For many people the thought of erecting a six foot by eight foot greenhouse on their own can seem a daunting prospect. This can lead to them having to make a further outlay by paying for a professional installation service, or even worse it can lead to them missing out on the many advantages that a high quality greenhouse such as this can bring. 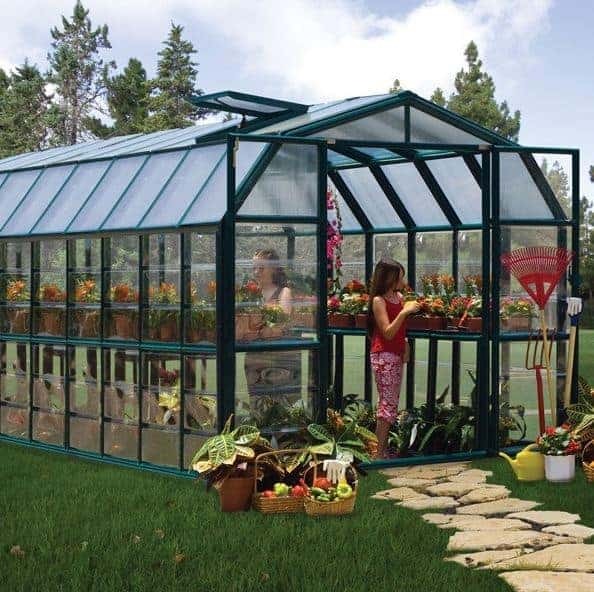 That’s why we rate this ingenious and cleverly designed Palram greenhouse so highly; it features an easy assembly system where the individual polycarbonate panels simply snap into place along the frame. It’s should be very easy to do as long as the instructions are followed, and it not only saves time and money it also means that you won’t need specialist tools for the assembly process. We were also impressed by the thickness of the walls on this Palram greenhouse, which at 0.7mm thick is greater than we often see on similarly priced greenhouses we review. For a medium sized greenhouse that’s tough and easy to assemble, and that has in built ventilation thanks to its opening roof panel, we feel this represents very good value for money, and it’s this that gains it a place in our WhatShed top fifteen league table. This is a Palram greenhouse that’s green in more ways than one, which is why it will appeal not only to us but also to home gardeners who are environmentally aware and who keep a close eye on their carbon footprint. It’s thick resin frame is very tough and durable, and has been designed as a greener alternative to the aluminium and galvanised steel that Palram also use. It also means that it’s completely free of rust worries of course, and because the resin used is high quality and UV resistant it also won’t fade or discolour over time as some plastic substrates can do. For these reasons, don’t be surprised if it lasts much longer than the 5 year warranty period supplied with it. The glazing on this Palram greenhouse is also thick and reliable, as double walled polycarbonate has been used, and we imagine that this gives excellent insulation properties as well as allowing lots of light through to the plants inside. Another thing that appealed to us about this greenhouse was the design itself, as it incorporates a four sided staged roof. It’s very attractive and eye catching, and the higher eaves that it produces also means that there’s a little extra head room to move around in. Most of the metal greenhouses we review have either have a silver or green coloured frame, but we found this dark grey frame particularly pleasing on the eye. It’s a little thing, but one which makes it seems effortlessly stylish and which will add to the overall appeal of your garden. This is one of the heavy duty Palram greenhouses that have been designed to withstand everything that the British weather can throw at it, and the effectiveness of its construction in this regard is shown by the provision of a 10 year guarantee rather than the 5 year one that Palram normally provide. It’s a mark of confidence from the manufacturer that we welcomed, and after reviewing it it’s a confidence that we share as well. The aluminium frame was noticeably thicker than we usually find on a Palram greenhouse, and it also comes with an integrated anchoring system that should make it feel very stable once assembled. We feel this is especially important on larger greenhouses, and with a base area of eight foot by sixteen foot this is one of the largest models in our league table. It also comes with a premium price tag that reflects its premium quality, however, and this has been taken into account when deciding its final positioning. This is the second Rion EcoGrow model to gain a place in our league table of the fifteen best Palram greenhouses that can be bought online in the UK today. It’s a slightly smaller model, and therefore we feel it offers slightly less value for money, which is why we have given it a lower ranking. At a price of not much more than five hundred pounds for a well built Palram greenhouse that has a base area of 1.97 x 1.97m, however, we still feel that it represents more than reasonable value for money. Once again this has the four sided roof that we find very attractive, as well as the dark green colour scheme applied to the thick resin frame. It’s sure to get neighbours and visitors talking, so it won’t just be the plants that you’re growing inside that attract compliments. What we liked most about this Palram greenhouse, though, is that it incorporates an easy assembly system which can save a lot of time when it comes to installing the building, and the base should also be both tough and easy to assemble without the need for any specialist tools. 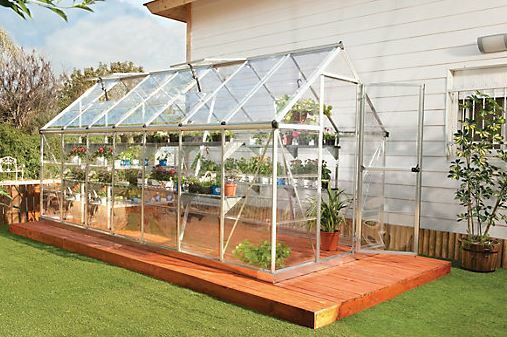 If you’ve been thinking about buying a compact greenhouse, but weren’t sure when you’d get the time to assemble it, this could be your ideal purchase. 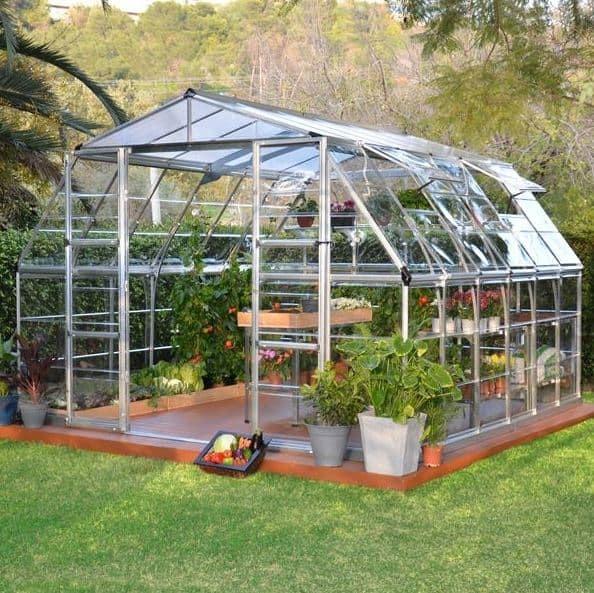 This silver coloured Palram greenhouse has been designed for those who need a lot of growing space. It not only has a base area of 3.65 x 3.65m, it also has a very accommodating maximum height of 2.65m. This makes it a great choice not only for the keen amateur gardener, but also those who grow plants or produce on a commercial or semi-commercial scale. 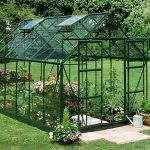 For such people, this will represent excellent value for money when compared to some similarly sized professional grade greenhouses, although we appreciate that the asking price of over eighteen hundred pounds could put out of reach of some domestic gardeners. To get the most out of this large Palram greenhouse, a large entranceway will be required as well, which is why we were pleased to see double doors that open to a width of 1.16m. With a door height of 2.22m as well, there certainly won’t be any need to duck down when walking in and out as we sometimes find with the greenhouses we review. We were also impressed with the stylish design of this Americana greenhouse, thanks mainly to its four sided barn style roof which also has two opening windows that can be used for quick and easy ventilation purposes. After the large and accommodating interior of the Americana greenhouse, we now come to the smallest Palram greenhouse to gain a place in our top fifteen league table. 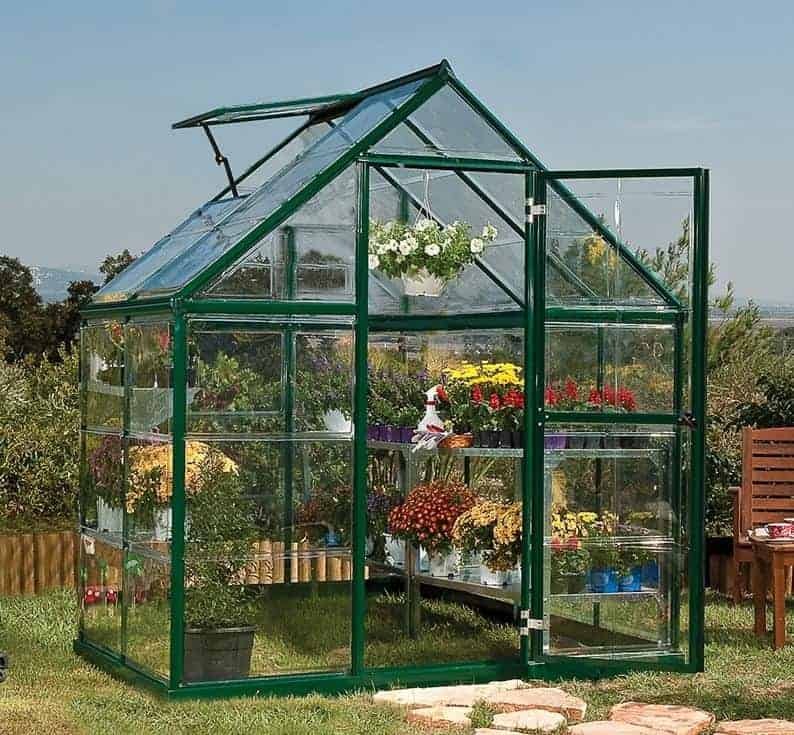 By necessity it lacks the versatility that a large greenhouse can bring, and it can only be used for relatively small scale growing purposes, but it also represents an excellent starter model or additional greenhouse for a price that is not much more than a hundred pounds. One other thing that distinguishes this from every other Palram greenhouse in our league table is that it has a lean to design rather than being a stand alone garden building. This means that it is attached directly to a house wall, and this should give it much more stability than you might imagine as well as giving it extra weather protection from wind and rain. We were pleased to see that the wall mounting kit included with the greenhouse should make it very easy to position. We were also impressed by just how easy it is likely to be to move plants in and out, thanks not only to an opening door but to an opening lid that can be held into place by tough metal struts. We feel this would make an ideal purchase for a small garden, or it could even be positioned on a balcony area. We move from the smallest Palram greenhouse in our list to the largest, which shows the diversity of models manufactured by Palram, as well as the high quality construction that we inevitably find. With a base area of eight foot by twenty foot, and a peak height of 2.51, there’s a huge amount of growing space available which is why we can imagine it being snapped up by semi-professional gardeners or those who hope to expand their gardening hobby into a money making venture. With such a large interior space available, this Palram greenhouse opens up many new possibilities to the owner. For example, we can easily imagine it being used as a garden spa or the location for a hot tub. With integrated roof vents you won’t have to worry about it becoming too hot inside whatever you use it for, and the crystal clear polycarbonate glazing and dark green frame mean that it can also be an attractive garden feature in its own right. This is certainly one of the most imposing greenhouses that we’ve seen, and it’s only the asking price of approaching two thousand pounds that sees it at the foot of our league table rather than being placed much higher. 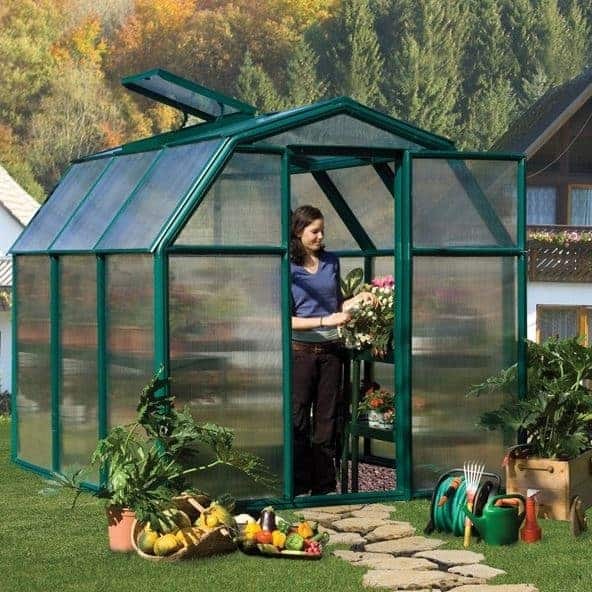 If this falls within your budget, therefore, it’s a greenhouse to put at the very top of your shortlist.